2 New Active Ingredients (Caesalpinia spinosa & Enteromorpha compressa) proven to reduce wrinkles and increase long-term firming of the skin. Why not use this new Hydrating Firming Serum in a different way? Mix with your favourite moisturiser or facial oil, blend together and apply to give you the same rich nourishment but with a youthful firming of the skin. This natural skin care product is made without Parabens, Lanolin, ethyl alcohol, artificial perfumes, petrochemicals, phthalates and colourants. Aqua, *Glycerin (vegetable derived), Enteromorpha Compressa Extract (and) Caesalpinia Spinosa Gum, *Sempervivum tectorum (houseleek) extract, Levulinic acid, *Aloe barbadensis (aloe vera) powder, *Helianthus annuus (sunflower) seed oil, *Olea europaea (olive) oil, *Althaea officinalis (marshmallow) extract, *Chamomilla recutita (chamomile) extract, Xanthan gum, Carrageenan, Aroma [*Rosmarinus officinalis (rosemary) oil, *Pelargonium graveolens (rose geranium) oil], Yucca schidigera (yucca) extract, Potassium sorbate, *Geraniol, *Citral, *Citronellol, *Linalool, *d-Limonene (from essential oils). *95.74% certified organic ingredients. Use sparingly morning and evening after Gentle Cleanse™. Apply to the skin with a light tapping motion. Complete your daily skin care routine with Green People Day Solution™ , Vita Min Fix™ or Rejuvenating Facial Oil. Tip: Combine with Facial Oil for soft skin and to make an effective base for our organic mineral makeup. 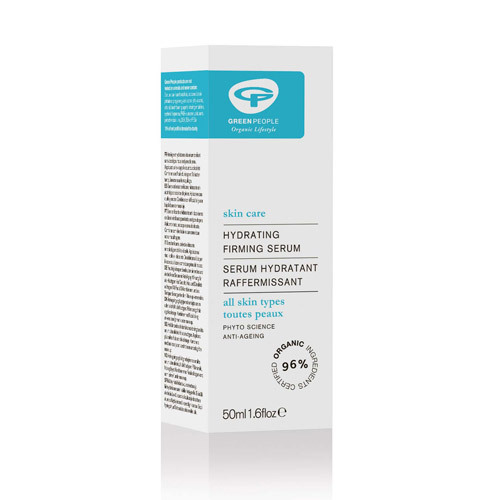 Below are reviews of Green People Hydrating Firming Serum - 50ml by bodykind customers. If you have tried this product we'd love to hear what you think so please leave a review. I love this product! It smells beautiful and it may last forever as it only needs a tiny bit on my face. Love this product! I have been using it for a few years now and is always part of my skin care routine. Its light, absorbs really well, smells beautiful and you only need a small amount.